The U.S. president arrived in Singapore today for talks that could change the course of history and earn him the Nobel Peace Prize, if successful in convincing the world’s most isolated nation to end its pursuit of mankind’s most deadly weapons. After a grueling 21 hours of travel that included a refueling stop on a Greek island, Trump touched down at Paya Labar Air Base on Sunday evening. He gave a short wave as he deplaned, and told journalists nearby he was feeling 'very good' about his meeting on Tuesday morning local time with Kim Jong-un. He gave a short wave to the press, and told journalists nearby he was feeling 'very good' about his meeting on Tuesday morning local time with Kim Jong-un. 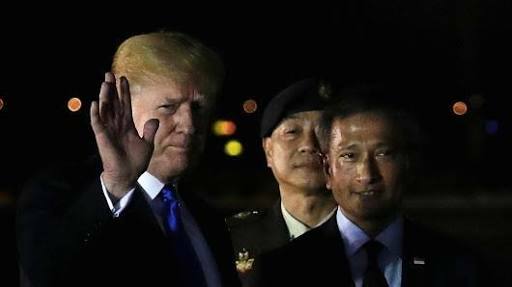 US President Donald Trump (C) is welcomed by Singapore's Foreign Minister Vivian Balakrishnan (L) after Air Force One arrived at Paya Lebar Air Base in Singapore on Sunday evening.